So I have both of the S.Belle Panda, Normal and mystic ones. I'm just wondering if any of you guys have seen the lips of this version of the doll with as much as pale as the one on the left. I got her in new condition so I think the Lati company might did it with wrong shades? I've seen some of others S.Belle Panda with normal eyes and all I can say is their lips are as bright as my mystic one. This is a discussion for LatiDoll Yellow. 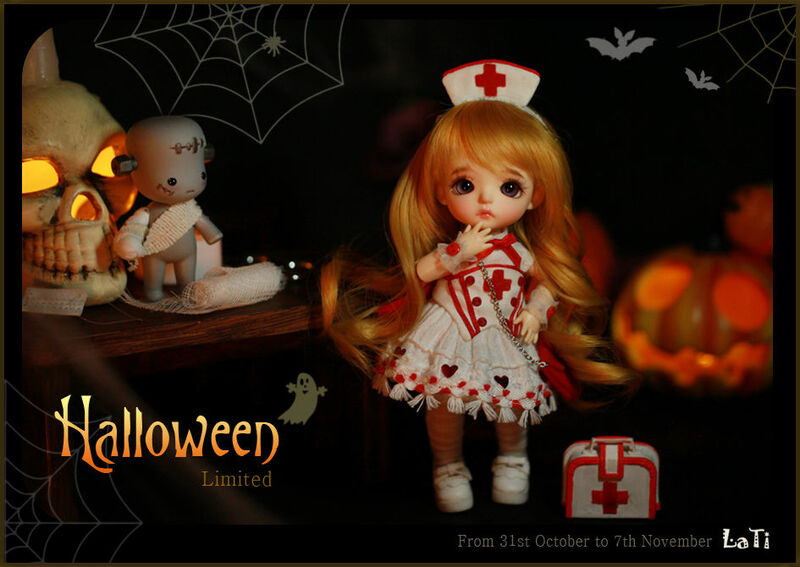 The Lati Yellow line are the most popular dolls produced by LatiDoll. The genderless basic "renewal" body is 16 centimeters tall, with the special bodies (abbreviated SP) which can be male or female are roughly 20 centimeters. My Panda Belle's lip color seems to be somewhere between your two. Here is mine! Edit: anyone know why the image shows when I'm editing the post, yet it shows up as a red X on the final post? I love to give to my Lati Yellow girls tiny companions, they are super cute together!! Your Euphie and teeny Artemis are adorable and now I want a little pet for my girl! I've been waiting for Princess Cinderella Happy for over 11 months now. I really hope she comes home by next month and that I don't have to wait over a year for her! I've decided who will be my future G.Yuri girl. I was thinking a lot between Human Diana and Chibiusa, but as I have now Chibi Chibi and Usako too, I think we need a Chibiusa next year. Also I saw some close photos of the recent event doll G.Yuri in NS, and she will be a perfect Chibiusa indeed! I hope the thread will be a little bit more active, so here are we again with Euphie's finished full Human Luna outffit, and my Cheeky Usako. Has anybody any information about what is going on with Latidoll? They still seem to be way behind with their deliveries (taking a year or so) though they have not had many large releases this year, mostly a doll or two offered at some event and possibly on the net for a short period only. Usually they have an anniversary release about this time of the year, but there has been no sign of it this year. I'm not sure if I dare to order from Latidoll any more unless they come up with something really extraordinary. I'm also really confused about Lati's status, they seem to dig themselves deeper and deeper into this hole with their preorders after preorders with people waiting for a year. That's why I bought my Lati secondhand, I just can't deal with waiting more than 5 or 6 months for a doll (6 months is pushing it, really). Your girls look fantastic together and I love their eyes! You definitely need a Chibiusa and I look forward to seeing her once you've completed her. I'd rather Lati keep making the past orders than take time to design and release new dolls. In two weeks, I will have been waiting a full year for my Happy. I like your Coco's faceup - it's pretty with nice colors and compliments her face shape. I have no information on why they are so behind but I did contact them about my Happy from the Cinderella release and they said "Due to delay in manufacturing schedule ..your order will be shipped out next week." I wish I would have known they were releasing her in tan skin shortly after. I would have loved to have her in tan and it seems those orders shipped very quickly. Yes, now they are really really slow with the Cinderella release. I think they are having financial issues, because otherwise they would hire more people to work out the delays. I think they are paying from the recent event's money the actual production, so this time the Cinderellas, so they're always seeking for new money to able to do the 1 year before ordered dolls. From here it almost seems they don't care. Your Coco is really cute! Congrats!! Yes, exactly these are my thoughts too. My other option is Dollpeddlar, they receiving randomly basic dolls too, and sometimes older releases, and they are accepting layaway, so I am very very happy with them. Which Cinderella did you ordered? I think the princess Cinderella has the most beautiful face up! Still waiting on my Cinderella order as well, I just wrote Lati about it again I had inquired last month and they had swore early October it is now the 13th and this Sunday will mark the one year point since I placed my order. I'm beyond out of patience with them. I'm waiting for a Lati White SP Sophie, the full event doll and a steward animal companion. I e-mailed Lati today about my order. I'm really disturbed that my password doesn't work and I can't post a Q&A. The form said it sent my password but it didn't. Is the naver email the right one? The order confirmation email was sent from a different one. Yesterday was one year of waiting for my doll. I just hope she gets here safely and I won't be ordering from Lati again. Hopefully to be received by Halloween 2017!! So cute! Sorry to be a newb, Bagirka, but what sculpt is she?